typing, and share the recipe with you already! So here is it..
Wash the kale and rip the leaves away from the stem. Place leaves into bowl and toss in olive oil and sea salt. Place on baking sheet and into the oven for 10 minutes or until the leaves are crunchy and brown on the ends. Since I am on the topic of crunchy foods to replace chips, I thought I would mention popcorn. Popcorn is actually a whole grain, so it can be healthy for you if it is not drenched in butter and salt. All I do is place a small amount of olive oil into a pot on the stove top with 1/4 cup of popcorn kernels on medium heat and place lid on pot. I shake the pot about 3 minutes into cooking (my thinking is that it will prevent the kernels from sticking to the bottom of the pot but I have no real reason haha), anyways…after all the kernels have popped, take off the stove top and place into bowl. You can add a small amount olive oil and/or sea salt, cinnamon, pepper, chili pepper or whatever salt-free spices you would like. I hope you all are enjoying my posts and if you have any ideas for me, please feel free to let me know!!! This is still all so new to me and am trying my best to let you on in my journey. Hopefully I can inspire you to join me on my journey of getting healthy, eating clean and exercising. 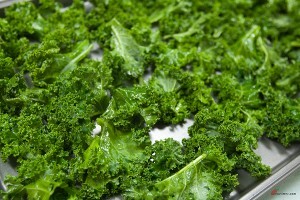 Tiffy……are these Kale chips good…..am I still gonna want Ms. Viki’s after?! Haha, I love them and even your brother does! It hits the spot for us. You need to kick Ms. Viki to the curb, she can be hard to get rid of.